If you think that you may be ready to put in a new swimming pool in your backyard, there are some things that you will want to do to prepare for the new addition. In addition to finding a reputable pool builder, you will also want to ensure that your children are aware of pool safety and are taking the necessary steps in learning how to swim and feel comfortable within the water. While swimming pools at home can be a great deal of fun, they can also be very dangerous if you are not careful. By taking advantage of these 5 things that you should do before putting in a pool, you will be preparing yourself for all aspects of the installation and after-installation maintenance. With many different pool builders out there, you will want to find one that is reputable, credible and offers affordable pricing on the type of pool that you are interested in having installed. A smooth building process starts with hiring a swimming pool construction professional. Look into real customer reviews and ask friends and family for recommendations on a pool builder before opting to go with a specific company for putting in your new pool. Another thing that you will want to do before putting in a pool is to research the different types of pools that are available for installation. You may choose either an above-ground pool or an in-ground pool. A pool is a major investment, so you will want to be sure to take all aspects of the installation process into consideration before taking the leap into putting a pool in your backyard. 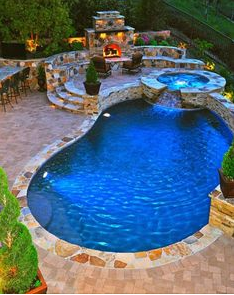 Write down a list of all of the different features that are absolute must-haves in your pool. While you may be working on a specific budget, having everything installed all at one time can save you money rather than deciding on additional features that you really want down the road. Go for all of the features that are must haves for you to make your pool absolutely perfect. When installing your new pool, it is important to have all of the necessary safety features that will make the pool safe for your entire family. A child-safety fence is highly recommended in order to keep children away from the water when you are not present. Pool alarms can also be installed to alert you when someone enters the water. Look into all safety features before putting in your pool to decide exactly what makes sense for your family. Before putting in a pool, it is highly recommended to enroll your children in SwimJim swimming lessons. These swimming lessons are available in the Houston, Texas and New York regions. There is nothing more important than ensuring your child’s safety whenever possible. These quality swimming lessons are designed to introduce your children to the water while teaching them the skills needs for staying afloat and maneuvering themselves around within the pool. They will also give you the peace of mind to know that your child is safe from harm while swimming in your own backyard.